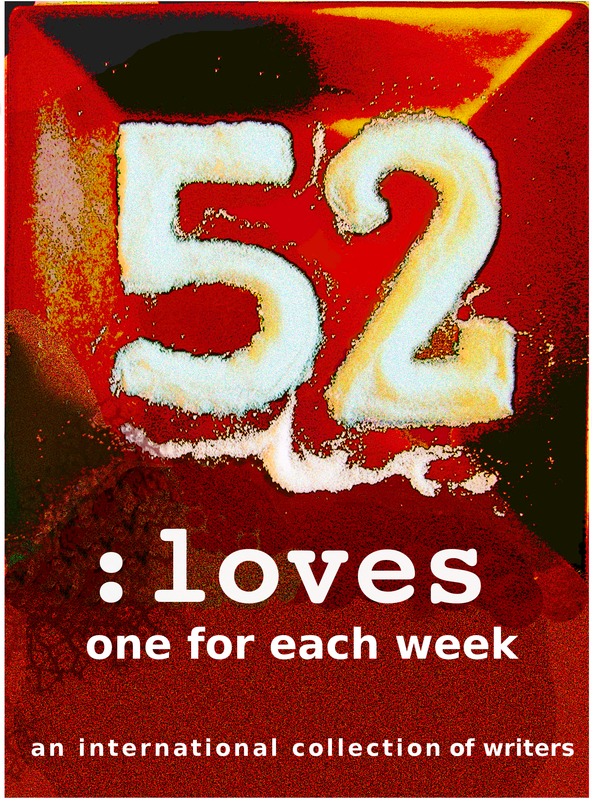 my story Neutral Ground is just published in 52 :Loves – a story for every week of the year, all about Love, but not necessarily how you’d think. Kindle only at the moment but you never know. On Thursday 5th at 7:45 in my capacity as publisher, I’m ‘compering’ a reading of Devilskein & Dearlove by Alex Smith at Lewisham Library 199 Lewisham High Street SE13 6LG more details over on the Arachne Press Website. Shouting about Lesbian Literature – coming out as a lesbian writer. Cherry Potts first collection of lesbian short stories, Mosaic of Air was published over 20 years ago, and she now owns her own independent publishing house, Arachne Press. V. A. Fearon’s first self-published crime thriller, The Girl with the Treasure Chest came out last year. What has changed for the Lesbian author in the interim? What has the recent surge of self and indie publishing done for lesbian literature (and what is it anyway)? Two personal approaches, with readings. Thursday 26th I’m at Richmond Lending Library, Little Green, Richmond, TW9 1QL at 7pm doing readings and talking about writing and publishing. Join writer and publisher Cherry Potts for an evening of readings and informal discussion of Lesbian & Gay writing with a whirl through anything from myth, to science fiction. Cherry will read from her own work and others published by her award-winning publishing house, Arachne Press. 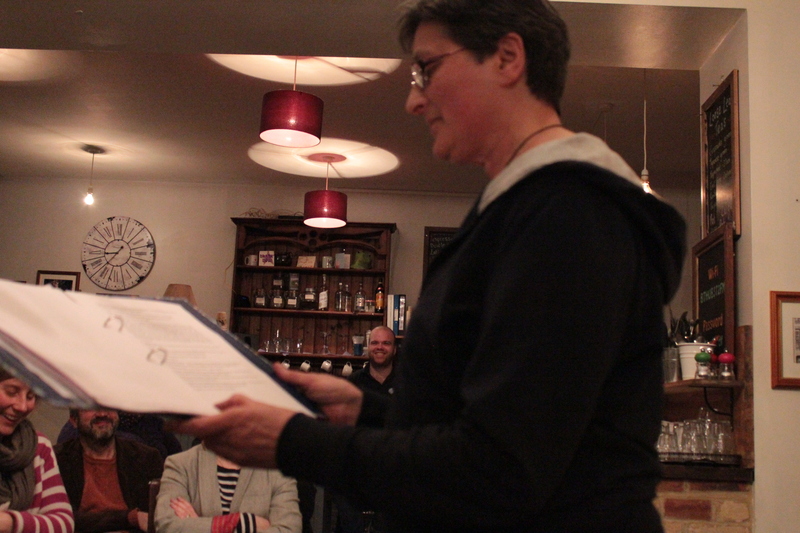 This event was very cosy – last public reading for LGBT History Month, and local, and with friends. I think we pulled out all the stops. Sadly Rebecca Idris had been sent to the Ukraine by her employers (what had she done to deserve that?) so was not able to join us, so we each read more than we would otherwise have done. Catherine Blackfeather reading from her novel Mitchie, about a young woman cross-dressing to survive the western frontier of nineteenth century Canada. 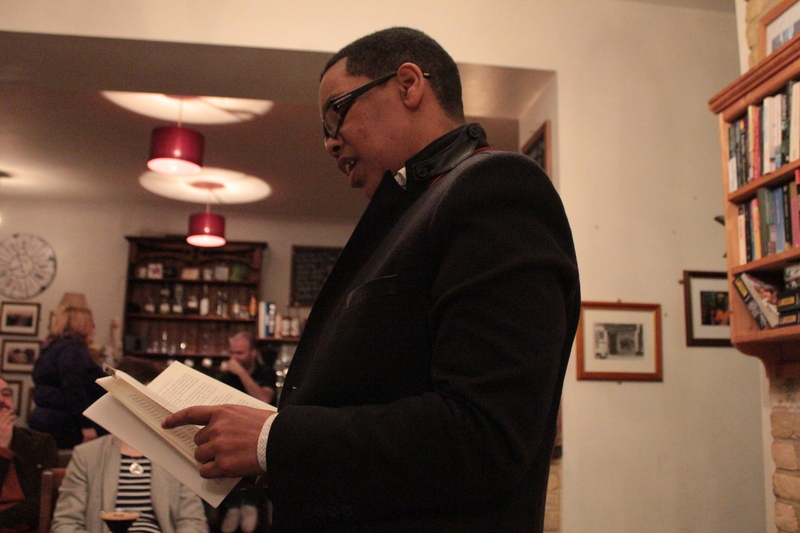 Me reading from Leaving (London Lies) a story set in a pub just down the road from where we were reading. V A Fearon reading two sections from her novel The Girl with the Treasure Chest about gang negotiator, Dani. And finally me again, with a section of A Second-hand Emotion – in which preparations for a big date are in full swing. We all really enjoyed the event, thanks to Richard Shaw (Hither Green Hall) for organising and Bobby Mizen (Cafe of Good Hope) for hosting, and thanks for the audience for coming along, laughing in the right places, and contributing to the collection for Gay Switchboard. This is about as local as you can get for me, the library is a twelve-minute walk from my house, so I was very pleased to be invited to read. A small audience but a generous one, they bought more books than the other LGBT history month events put together, and most of us ended up at Mr Lawrence’s for a drink after, so a lovely evening! Once again Alix joined in, reading the voice of Rowan in Rowan’s version, with me reading Maggie/Peggy; and the archivist in Arachne’s Daughters with me reading the spider – both from Mosaic of Air. Thanks to Nicky and Lira for organising! I’m doing ONE more LGBT History event open to the public, Wednesday 26th February 7pm Rainbow Readings at The Cafe of Good Hope, Hither Green Lane SE13. This is a ticketed event £3 (proceeds to the Jimmy Mizzen Foundation). I will be on Out in South London on Resonance 104.4 FM this evening sometime between 6.30 and 7.30, if you feel like tuning in. I’ll be talking to Rosie Wilby about LGBT History month and … stuff. This week I did two readings from Mosaic of Air for LGBT History Month, the first at North Kensington Library. Here I read from Ladies Pleasure, which is set in an old people’s home. And a new piece Clock: most of the action takes place at the top of a thirteenth century clock tower in a north european town, although the action is set in the late nineteenth century. and finally, Penelope is No Longer Waiting, my first ever published story, in which the Odyssey gets a different ending. The plan is to read different stories at each event, so watch this space for more video or audio recordings, or come along to the last three events: The Story Sessions Queer Tales on 19th February, Crofton Park Library on 21st, and Cafe of Good Hope Rainbow Readings on the 26th. Oh, and I’m going to be on the RADIO, on Out in South London on Resonance FM on Tuesday 18th February at some point between 6.30 and 7.30, repeated Sunday at 10am, talking about LGBT History Month. Alix’s birthday treat – Tippett’s King Priam by English Touring Opera at the Linbury Studio, Royal Opera House. This is what happens when you get involved in community opera – you get friends with the professionals, and you go to see something because someone you know is in it, (four someones in this instance – Grant Doyle, Nick Sharratt, Charne Rochford and Clarissa Meek) and you expand your musical horizons. Pertinent in the centenary of WWI to be at an explicitly pacifist opera, and pertinent also in LGBT history month to be at a work by an openly gay composer, and a gay relationship depicted in Achilles and Patroclus. And anyone who knows me will know I will take an interest in anything based on the Iliad. A useful pre-performance talk involved a climb to the top of the building and then a rush back down to the bowels of the sub-sub-basement that is the Linbury. I did find myself wondering whether it is possible to write a drama about pacificism without writing about war, but then I got caught up in the action and the music and forgot about it. Tippett’s work is clever and thought provoking, allowing us inside the head of the title role as Priam speaks to both Hermes (Adrian Dwyer – excellent) and the key players in the fateful decision to condemn and then save Paris as a child. As a chorus member I pay a lot of attention to choral work, and Tippett is generous to his chorus, giving them first shot at scaring the audience, with a stunning bit of orchestrated screaming at the beginning (which is echoed at the end), that had me sitting up and thinking, oh-ho, this is going to be fun. In the confined space (and fourth row seats) the sound absolutely battered me. The chorus for the Trojan slaves in act three was excellent too and the chorus were well choreographed, making good use of the limited space, and very comfortable with standing stock still but still acting, particularly when they glare out into the audience as they follow the imagined course of Hector’s corpse dragged behind Achilles’ chariot. The opera relies on trios both dramatically and musically and they work magnificently; three goddesses, three commentators – Old Man, Nurse, Young Guard), Hecuba, Helen and Andromache, Priam and his two sons, and in this production the battle scenes resolve into threes regularly too. The music for the trios was the most interesting for me – the solo instrument accompaniment for the solos I found a bit obvious and contrary after the first few times, and lacking subtlety, but then I don’t think Tippett was after subtlety. I absolutely cannot fault anyone on their singing, the whole evening was a feast for the ears, from the piping of choral scholar Thomas Delgado-Little as young Paris, and Clarissa Meek‘s stern Nurse, right through to Grant Doyle‘s cheerfully pugnacious Hector. Dramatically speaking Laure Meloy is a ferocious Hecuba, while Camilla Roberts is a rather sulky Andromache – Tippett’s fault not Camilla’s, Andromache is more Roman matron than Trojan widow – the implied entitlement to her position and her grief at the death her husband (ranting about whose grief is more important), is rather unappealing. I’ve always had a soft spot for Andromache and it pained me to see her characterised like this. Much is made in the programme and the pre-performance talk of the third act scene between Helen and Andromache and Hecuba, but I found it a bit expositional (if that’s a word), and I found Helen herself profoundly irritating, I did not feel Niamh Kelly‘s sultry temptress (all Theda Bara) got close to the required demi-goddess we are meant to see, and Helen is meant to present in herself (‘I am Helen’ she sings regularly, as though excusing herself and everyone else for bad behaviour) she has a fabulous voice however. Interestingly, the characters which Tippett more or less invents – Old Man (Andrew Slater), Young Guard (Adam Tunnicliffe) and Nurse (Clarissa Meek) get some of the best moments, perhaps because Tippett didn’t feel the need to stick to the Iliad. The design got in the way occasionally, the metal shape mid-stage which acts as throne room, natural rock outcrop and temple, occasionally blocked the chorus and indeed the orchestra – although in seat higher up it might not have been a problem. Although the women’s costumes were mostly exquisite (especially Hecuba), and the use of bone, antler and feather, whilst illogical, was rather entertaining, I was bewildered by the thrown-together look of the male cast – nothing seemed to fit, and the less said about the Japanese style eiderdown skirt for Priam, and curtains (no really, they were definitely curtains) for Paris’ trousers the better; both Roderick Earle and Nicholas Sharratt rose above these impediments, in particular in the scene when they sing a trio on the walls, as Grant Doyle’s Hector prepares to go out to face Achilles, his bravado undermined by dread, and silly Paris still not getting it that this is all his fault. Nick also got the silliest helmet award – the only men comfortable in their armour were Patroclus (ironic since it was meant to be borrowed) and the Young Guard. I was disappointed that I occasionally needed the screens with the words (inconveniently to either side of the stage) Mostly the diction was crystal clear but with Charne Rochford I struggled, which was a pity as his scene with Patroclus (an excellent Piotr Lempa) was beautiful, having to glance away to work out what he was singing was a shame. It is a bleak work, but there are flashes of bitter humour – Paris, suggesting he, Helen and Priam escape and found a new Troy (foreshadowing the Aeneid) is rebutted by Priam with you aren’t the founding sort; the chorus of slaves not caring who owns them – it’s just a change of ownership. Tippett constantly contrasts cruelty and compassion, and a complexity of what-ifs leading from the first prophesy of Paris’ life meaning Priam’s death (but not Hector’s, as his stricken father weeps) to perhaps generations of retribution; Roderick Earle absolutely convinces as Priam in these later scenes.And it is, appropriately, the grief in the opera is the most convincingly played, with Achilles’ war cry, sung on stage by Charne Rochford, a wordless ullulation of anguish and anger, like a baying hound, fatal and threatening and despairing. I’m sure the rest of the run is sold out, but it would be worth checking for returns, despite my minor quibbles, an exciting evening of first class music.